Knowledge is a weapon! 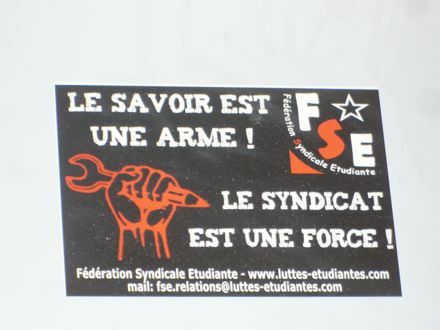 … The union is a force! This is the continuation of my last post about the visual culture at the University of Toulouse (Mirail). Just having seen the 14 Juillet, i.e. Bastille Day, the national holiday in celebration of the 1789 French Revolution, it’s tempting to draw some comparisons with a rather different, far more legitimate kind of political landscape: that of the enormous military parade that took place Tuesday morning on the Champs-Elysées. Yes, I went, curious to see what exactly was involved in this enormous national pageant. Last week while I was in Toulouse, I went to take a look at the local university (Mirail), to see if it turned out to be the one in the video I posted about last week. And indeed there were a large number of decrepit buildings, occasionally graced by lovely flowers. 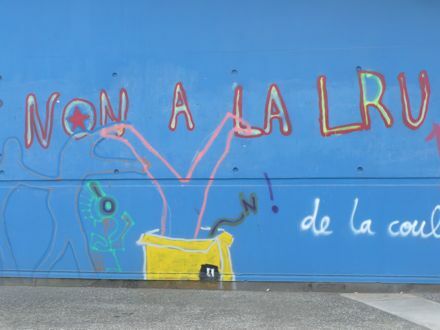 But the buildings also turned out, like Paris-8, to display an intense activist visual culture: of graffiti, of slogans, of icons, of murals, of messages that contradicted each other, of clashing color. No to the LRU! says a figure falling into a trash can. Or is it the LRU itself that’s falling into a trash can? 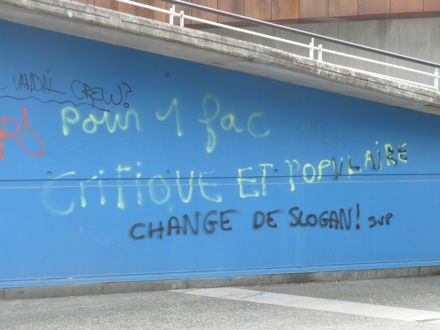 “For a critical and popular university [fac]!” Apparently this is a traditional militant slogan at Toulouse. “Get a new slogan please!” is the caption written below by someone who apparently disagrees or is simply bored. [La fac, i.e. la faculté, is a now bureaucratically obsolete term that used to designate a college, a faculty, a division – as in the Faculty of Arts, the Faculty of Law, etc. It is still used in common parlance to refer to the public universities – les facultés – as opposed to other institutions of higher learning (private business schools, elite government institutes, and the like). Seem to be on a translation kick. Translating is good for me; it makes me read much more closely than I would otherwise. I recently came across the very curious Europhilosophie, which seems to group together a number of philosophy working groups (on Kant, Nietzsche, Sartre, Bergson, Fichte, phenomenology, materialism, and psychoanalysis, among others). An acquaintance of mine, doing a thesis on the situationists, is part of the Groupe de Recherches Matérialistes. It turns out that members of this group offer seminars in various places. For your entertainment I therefore present the course description for a seminar on “Reading Marx/Readings of Marx” (Lecture(s) de Marx). 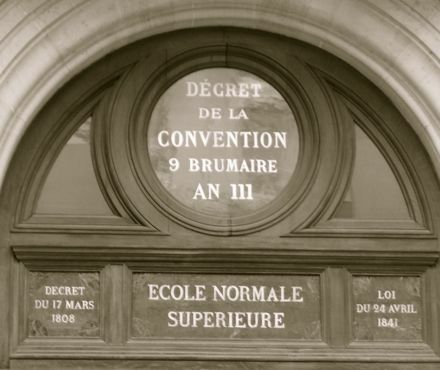 It will be offered next fall at the (very philosophically prestigious) Ecole Normale Supérieure. A few months ago, Baptiste Coulmont posted a sarcastically titled video called “our beautiful university” that testifies to the squalor and physical deterioration of a university campus in the south of France, Marseille or Toulouse I think. 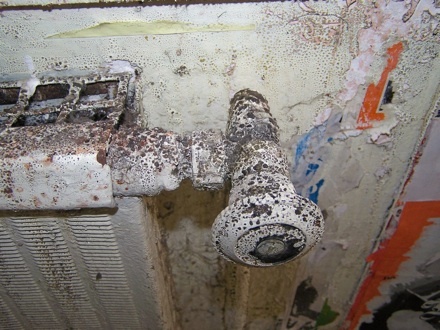 It’s essentially a youtube montage of photos of decrepit university spaces; the photos are also collected at Picasa. At times, the mold approaches the complexity of mountaintop lichens, or perhaps it’s more like a spontaneous display of abstract art. 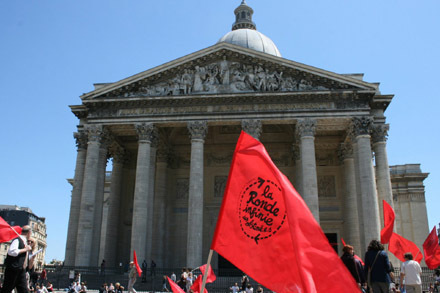 One day a few weeks ago I stopped by a political demonstration against the French university reforms. The organizing group, La Ronde Infinie des Obstinés, specializes in what are essentially indefinitely long circular marches, rather after the pattern of a vigil. Their name amounts to “the infinite rounds of the stubborn,” though someone tried to explain that une ronde infinie could also be interpreted as a merry-go-round! At any rate, the idea is that by marching nonstop they can manifest their “infinite” determination and commitment to the cause. But what cause, you ask? Well, for those anglophone readers out there, I thought I would give a rough translation of their pamphlet (French original here). As you’ll see, on this occasion they were trying to persuade French candidates for the European Parliament to take a stand on university reforms. A sudden piece of English text inserted in the middle of an exhibition of political photographs at my field site. Paris-8. A charming metacommentary on global reality. 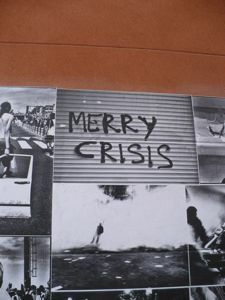 Merry crisis! If you wanted to describe this image in the most basic descriptive language you could say: this is a photo of a photo of a graffiti tag set among other photos, photos of people bloody in protests, of police in riot gear lines, of people running and throwing things, of people invisible in showers of light. See that flood of white in the photo immediately beneath Merry Crisis? With the figure askew and silhouetted? I have no idea what that is. But I do comprehend that this is a collage of leftist protest culture, aestheticized in the genre of an art photo exhibition, and further recontextualized in the form of political statement attached on the outside of Paris-8’s Bâtiment B2. Paris-8 is a university with an enormous visual text taped and sprayed across its walls. Campus buildings frequently have deteriorated walls, just from the sheer number of signs (affiches) that have been put up and torn up and torn down. 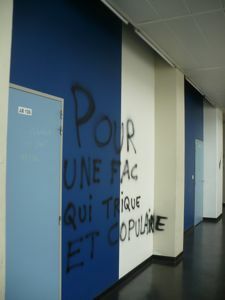 It’s the kind of place where images, like this one, are not only compound visual objects (referencing other visual objects and visual genres), but are units in an overwhelming student reappropriation of academic space, a culture of defacement of the corridors that someone jealous of property rights might call vandalism with a political alibi. This defacement has limits, though, being essentially restrained to surfaces within arm’s reach of the ground. The buildings themselves tell a different story.